Dragon’s Lair is the prototypical game sneered at for being more like a movie. In fact it was prototypical everything, released on a kind of prehistoric DVD called the LaserDisc and backed by former Disney director Don Bluth long before Spielberg started poking around in games. Its greatest asset has always been its colourful, characterful animation, so it makes sense that Bluth would bring it back as a thoroughly non-interactive feature film. Sucker for story? Play one of the best PC RPGs. Bluth and producer Gary Goldman have conceived a Kickstarter pitch which somehow manages to be compelling even as the game is repeatedly misnamed as “Dragon Lair’s”. The pair worked on 20 films together, some of which – Anastasia, The Land Before Time – are inseparable from childhood for a certain generation. Yet they recognise that Dragon’s Lair has had a longer tail even than An American Tail. 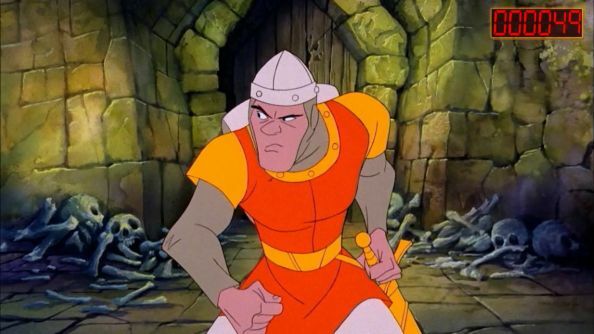 Dragon’s Lair has, despite its detractors, enjoyed a second life on smartphones. And it looks like Bluth and Goldman are right – they’ve raised nearly $50,000 of their $500,000 goal in the last day. Think they’ll make it to the top of the tower?